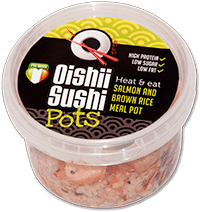 All Oishii Sushi products are made at our fully approved production kitchen in Smithfield. 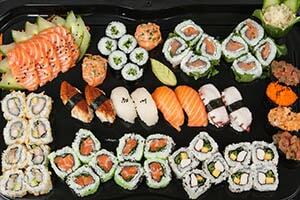 Our skilled team make fresh sushi 5 days a week (Sunday to Thursday), although we do sometimes work Fridays & Saturdays depending on orders / events which are happening. All of our products are handmade from the freshest of ingredients and we have a developed a good variety of sushi. You can choose from our vegetarian selection; meat based options such as chicken teriyaki & hoisin duck or opt for one of our fish sushi selections. Our Oishii Teriyaki sauce is award winning and so versatile and that can also be ordered here online. We also offer tasty chicken curry ramen noodles and healthy brown rice salads. As we don’t produce these products every single day, should your ordered item not be available, we will let you know and suggest a good alternative. What is common to all products is that they are all fresh, healthy & delicious! We cater to all needs so if you don’t see exactly what you’re looking for, just tell us what you want; when you want it and we’ll do our utmost to accommodate your request. Please browse from the Oishii prepack products. All products on this page are available to be ordered online. 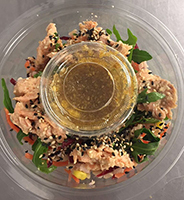 The minimum order is €10 and one of our Oishii sales reps will deliver to your home or workplace Monday to Friday before 1.30pm. The delivery address must be within the Dublin area, with the orders paid for online when you order. Please provide all the necessary contact details in the space provided. 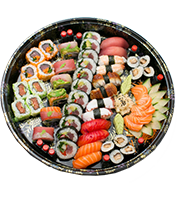 The regular prepack options can be ordered up to 7am on day of delivery but we do require 24 hours notice for all sushi platters or bespoke requests. We cater to all needs so just tell us what you want and when you want it and we’ll look after you! 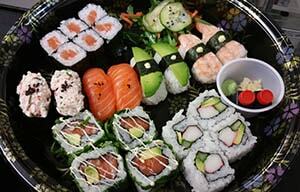 A 50 piece assortment of both fish & vegetarian sushi types, something for everyone!